The RFSA telemarketing scandal has damaged the reputation of the RFSA as seen in this newspaper editorial below. Until the RFSA becomes more transparent (property investments, expenditure and financial standing), the VFFA suggests that anyone wishing to make a donation should contact your local Brigade. 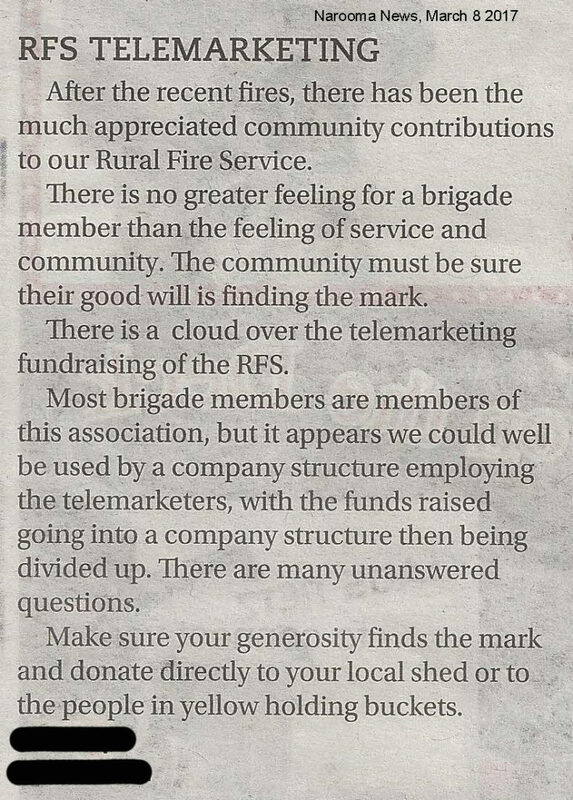 Note: The association referred to in this newspaper clip is the Rural Fire Service Association (RFSA). The name of the author has been suppressed because the VFFA is concerned about bullying and harassment of those who speak out. RFSA - How much did this cost? Where an appeal is conducted through means of a telephone, the authorised fundraiser must ensure that it is conducted in accordance with Part C of the ADMA Code of Practice published by the Australian Direct Marketing Association. 7. not make calls pretending to do research or a survey when they are really trying to sell something.